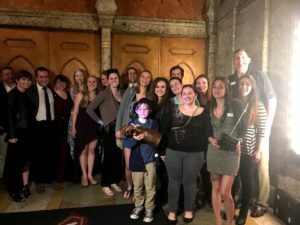 On Thursday, April 26, AWARE was honored by Marvel Studios at the Fox Theater premier of Avengers: Infinity War. 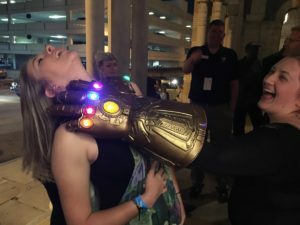 100 AWARE volunteers, staff, and family got to attend, and we were presented with a replica Infinity Gauntlet. Before the movie, our Director of Animal Care, Marjan Ghadrdan, walked the red carpet with our ambassador barred owl, Lady Owlbert Einstein. Some AWARE folks even got to hang out backstage with Chris Tucker (that’s right, Ruby Rhod from The Fifth Element(!)) before the show. But the wildest part by far was at the end of the movie when Thanos… on second thought, no spoilers – go watch it yourself. Thank you, Marvel Studios!